You may add a vase in checkout. Color choice available. This chic classic hand tied showcases the very finest large headed red roses beautifully.The roses & gypsophila complement each other perfectly & the elegant wrap and ribbon add a sophisticated touch. 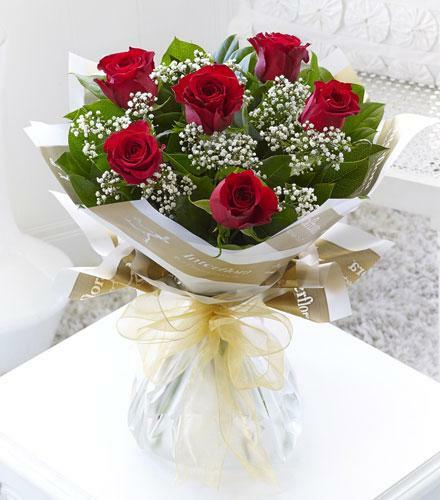 Euro Style Hand Tied Cut Bouquet - Six Stolen Kisses - 6 Red Roses Gift Wrapped. Arrangement Details: Featuring large headed roses hand tied with gypsophila and salal and finished with gift wrap and ribbon.